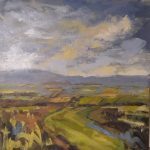 Sarah Warley-Cummings is an expressionistic painter and printmaker who regularly exhibits with the New English Art Club, Royal Society British Artists and Pastel Society at the Mall Galleries London. 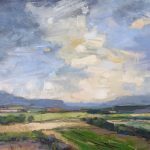 She has been a regular exhibitor at the gallery showing her highly inventive and original prints and we are delighted to now be showing her paintings for the first time. Sarah studied at Central St. Martins for a BA in Fashion and Illustration. After graduating she worked in Paris, London and Milan freelance illustrating for international magazines and newspapers, before joining Fleet Street as a fashion and news journalist. After ten years Sarah left to pursue painting full time. 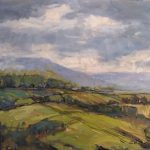 Her latest paintings are inspired by the countryside in West Sussex where she now lives. The work evolves from sketches made during walks along the South Down Way. 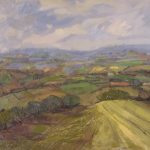 The rich colours of the fields, far reaching valleys and floodplains around the River Arun feature strongly in her paintings. Her work retains much of the sensitivity and energy first developed during her early years spent in Cornwall as a student living near the Porthmeor Studios in St. Ives. The artists of the St Ives school have have had a lasting effect on her work. 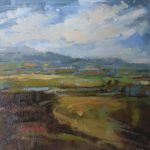 These semi-abstract oil paintings aim to capture something of the light, atmosphere and feelings of the countryside of the South Downs.